* Very interesting cross with Delago Deluxe, and sons of Street Cry. DUPORTH (AUS) (2005). 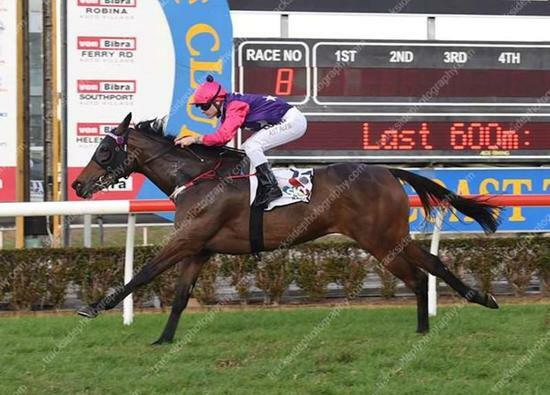 3 wins to 1400m, BTC Cup, Gr.1. Half-brother to SW Excites and SW Tickets. Sire of 182 rnrs, 115 wnrs, inc. SW Hey Doc (VRC Australian Guineas, Gr.1), Dashing Fellow, Ruettiger, SP Cornrow, Dee Nine Elle, Inkling, Two Over One - Wingold (H.K.) and of Let's Party Marty, Paceman - Sunny Dragon (H.K. ), Axanite - Racing Supernova (H.K. ), Dupe 'em, Another Sin, Fantastic Eight, Good Oh, Mooshakissa, Notio, Private Lounge, etc. Shower of Hearts (f. by Duporth). 6 wins. See below. Shelly Ann (f. by Danzero). Winner at 1000m in Aust. Ma Royal Hiney. Winner at 1650m, BRC Bollinger Champagne P., 2d BRC BMAG H., IGT & QHA H., 3d BRC Channel Seven H.
Giant's Headbutt - Precious (H.K.). 2 wins at 1600m in Aust. Giant Victory. Placed in Aust. Ma Victoire (Prince Ferdinand). 2 wins. See above. Ma Gloire (Spectacular Love). 5 wins to 1400m, NZ$79,587, BOP RC Kingfisher Mill H., Waikato RC Glenview New World H., WRC New Zealand Post H., 2d Manawatu RC Flying H., L, ARC KPMG Legal 3YO S., WRC NZTS 3YO H., ARC Waste Management P., 3d ARC DDB H., Counties RC Versatile Buildings H., Waikato RC Ashford Lodge H.
Hapi Hapi. 2 wins at 1200m, HKJC On Ting H., Shantou H., 2d HKJC Canberra H., 3d HKJC Flying Dancer H., Hubei H., Merry Merry H.
My Partner. Winner at 1200m, HKJC Sunset Peak H.
Win Bush. 7 wins from 1050m to 1800m in Aust. Power Ranger. 2 wins at 1000m, 1200m in Korea. Legal Eagle. Winner at 2 in NZ. Able Tassie. Winner at 1600m in Aust. Demon's Eye. Placed in Aust. Kowloon Peninsular. Placed in Aust. Kiwi L'Eglise. Placed in GB. Our Chantel. 2 wins at 1200m, 1400m in Aust. Ashanti. 8 wins-1 at 2-from 1200m to 2200m, Marlborough RC Morwenstow H., Nelson JC Caltex H., Pahiatua RC DB Tui Brewery H., WRC Douro Cup, Kelburn H.
Llantilly Lad - Gung Ho (Mal.). 3 wins at 1700m, 1800m in Malaysia. Llantilly Lass. Winner. See above. Kazatzka. 2 wins at 1600m, 2000m in Aust. Prince Gifu. 3 wins at 800m in New Caledonia. Basilia. Winner at 800m in New Caledonia. Lagos. 2 wins at 1550m, 2000m in Aust. Mr Spitz. 2 wins at 1400m, 2000m, 2d CJC Hei Hei H.
Battisma. 3 wins-1 at 2-at 1200m, 1400m, 2d CJC Ilam H., 3d Otago RC Vincent H.
Chapala. 2 wins at 1200m, 1600m in NZ. Quite A Lad. Winner at 1200m in NZ. Dragster. Winner at 2100m, 3d SAJC Alf Trim H., 3YO H.
Star View. Winner at 1200m in NZ. Dae Pyo Seon Su. Winner at 1000m in Korea. Race Record: 23 Starts 6-3-1 A$88,355. 6 wins to 1400m, A$88,355, GCTC Sky Racing H., 3d BRC Www.brc.com.au H.